Why choose concrete over pavers, tile, wood decking, etc. Landscape designers agree that the best way to create a unique and functional backyard patio is to design the patio in separate areas. Rather than placing one large slab at the back of the house, it is better to create outdoor rooms with several smaller or separated slabs. 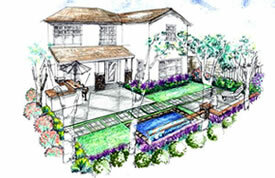 Layout Considerations: How will your patio be used? The first step in determining the best shape for your patio is to decide how your patio will be used. Do you entertain a lot? Will you need open areas for an outdoor table and chairs. Do you prefer quiet nooks and creating small, cozy areas perhaps with seating around a fire pit? How many guests do you typically entertain? Do you throw large parties? How many people usually attend? What type of surface do you think you would like? Patterned, smooth, textured, colored, etc. What patio furniture will you be using? Do you need to make room for a table and chairs, a lounge chair, an outdoor living room set, bistro table and chairs, extra bench seating, etc. If you find yourself designing your patio in rectangular or square shape, stop for a minute and consider the following. Could you round off the edges of your patio to make it look more natural with the surrounding landscape? What if you arched one side of your patio to give it some dimension? Would a circular area where your outdoor dining table will be placed be possible? The point is to consider a variety of designs and give your patio some uniqueness. In the end, you want your patio to create a welcoming atmosphere that blends with the architecture of your home and the natural landscape. Always keep in mind that the best outdoor patios create destinations in the backyard. Use walkways to connect these destinations and create interest with amenities such as focal points, seat walls, fountains, ponds, arbors, fireplaces, plantings, etc. See six examples of free-form concrete patios. Get ideas for your own free-form patio design. Copyright © 2010-2015 ConcretePatio.org. All Rights Reserved.